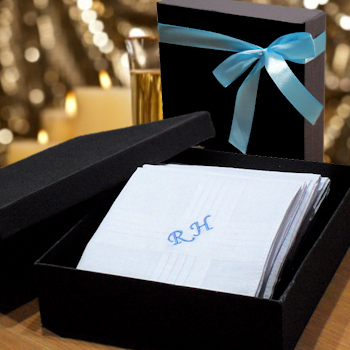 Mens cotton monogrammed handkerchiefs in black gift box tied with coordinated ribbon. 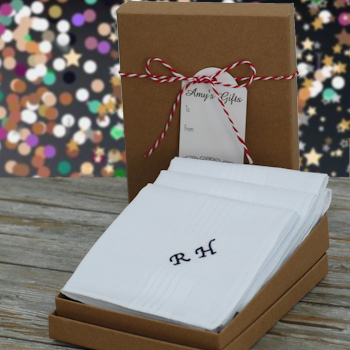 Mens cotton monogrammed handkerchiefs in black gift box tied with coordinated ribbon. Mens classic white cotton handkerchiefs monogrammed by bespoke embroidery with initials or short name presented in a black gift box. Select from a gift set of 3 OR a gift set of 7 mens handkerchiefs. Enter the name or initials to be customise and choose a thread colour and letter front style for the embroidery. Personalised Gifts are bespoke and customised to order. The gift set comes in a gift box tied with a ribbon making it a lovely present for a birthday, anniversary or Christmas.